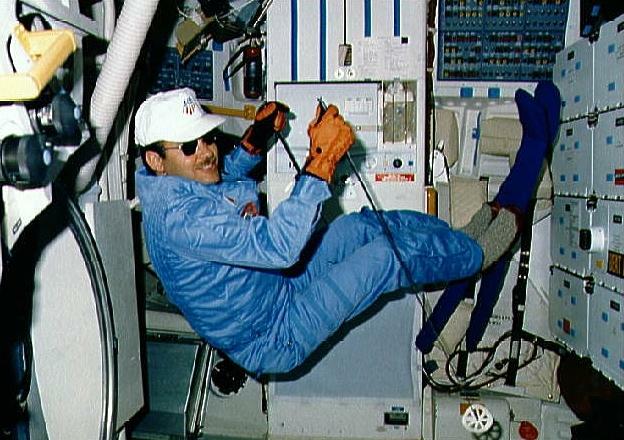 American test pilot astronaut 1978-1992. Grew up in Seattle, Washington. Flew 175 combat missions in Vietnam. Bachelor navy fighter pilot with a midnight blue corvette and a ski boat dubbed Sin Ship. Status: Inactive; Active 1978-1992. Born: 1943-04-28. Spaceflights: 3 . Total time in space: 16.85 days. Birth Place: Orange, Texas. PERSONAL DATA: Born April 28, 1943, in Orange, Texas, but considers Seattle, Washington, to be his hometown. Married to the former Terry Stanford of Little Rock, Arkansas. Recreational interests include skiing, tennis and boating. His mother, Mrs. C. Alberta Creighton, resides in Seattle, Washington. Terry's parents, Helen and Jim Stanford, reside in Stone Mountain, Arkansas. EDUCATION: Graduated from Ballard High School, Seattle, Washington, in 1961; received a bachelor of science degree from the United States Naval Academy in 1966 and a master of science in Administration of Science and Technology from George Washington University in 1978. ORGANIZATIONS: Member of the Society of Experimental Test Pilots and the Association of Space Explorers. SPECIAL HONORS: Awarded the Defense Superior Service Medal, Legion of Merit, Distinguished Flying Cross, 10 air Medals, the Armed Forces Expeditionary Medal, the Vietnam Cross of Gallantry, the NASA Distinguished Service & Leadership Medal, 3 United States Space Flight Medals, the French Legion of Honor and the Saudi Arabia King Fahd Medal. EXPERIENCE: Creighton started flight training following graduation from Annapolis and received his wings in October, 1967. He was with VF-154 from July 1968 to May 1970, flying F-4J's and made two combat deployments to Vietnam aboard the USS RANGER (CVA-61). From June 1970 to February 1971, he attended the U.S. Naval Test Pilot School at Patuxent River, Maryland, and upon graduation was assigned as a project test pilot with the Service Test Division at the Naval Air Station Patuxent River. During this two year tour of duty, he served as the F-14 engine development project officer. In July 1973, Creighton commenced a four year assignment with VF-2 and became a member of the first F-14 operational squadron, completing two deployments aboard the USS ENTERPRISE (CVN-65) to the Western Pacific. He returned to the United States in July 1977 and was assigned to the Naval Air Test Center's Strike Directorate as operations officer and F-14 program manager. He has logged over 6,000 hours flying time, the majority of it in jet fighters, and has completed 500 carrier landings and 175 combat missions. 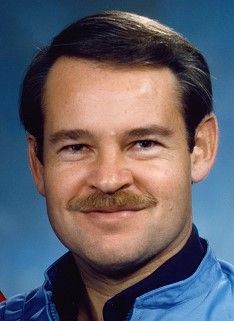 NASA EXPERIENCE: Selected as an astronaut candidate by NASA in January 1978, Creighton became an astronaut in August 1979. During the following four years he held a variety of technical assignments in support of the Space Shuttle Program. Following his first flight, Creighton became the astronaut representative to the Shuttle Program Manager. During the ensuing two years, Creighton participated in all the key decisions following the Challenger disaster helping to shape the plan for resuming safe manned space flight. Starting with STS-26, Creighton served as Lead "CAPCOM" for the first four Space Shuttle flights. In March 1989 he was assigned to command STS-36 but continued to serve as Head of the Mission Support Branch in the Astronaut Office until commencing full time training for his upcoming flight. Following his second flight, Creighton headed up the Operations Development Branch within the Astronaut Office for one year prior to resuming full-time training for his next command. Creighton served as pilot on STS-51G (June 17-24, 1985), was spacecraft commander on STS-36 (February 28 to March 4, 1990) and STS-48 (September 12-18, 1991), and has logged over 403 hours in space. Captain Creighton left NASA and retired from the Navy in July 1992. He is currently a Test Pilot with Boeing Airplane Company. SPACE FLIGHT EXPERIENCE: STS-51G Discovery (June 17-24, 1985) was a 7-day mission during which the crew deployed communications satellites for Mexico (Morelos), the Arab League (Arabsat), and the United States (AT&T Telstar). They used the Remote Manipulator System (RMS) to deploy and later retrieve the SPARTAN satellite which performed 17 hours of x-ray astronomy experiments while separated from the Space Shuttle. In addition, the crew activated the Automated Directional Solidification Furnace (ADSF), six Getaway Specials, participated in biomedical experiments, and conducted a laser tracking experiment as part of the Strategic Defense Initiative. Mission duration was 112 earth orbits in 169 hours and 39 minutes. STS-36 Atlantis (February 28 to March 4, 1990) carried Department of Defense payloads and a number of secondary payloads. Mission duration was 72 earth orbits in 106 hours, 19 minutes, 43 seconds. STS-48 Discovery (September 12-18, 1991) was a 5-day mission during which the crew deployed the Upper Atmosphere Research Satellite (UARS) which is designed to provide scientists with their first complete data set on the upper atmosphere's chemistry, winds and energy inputs. The crew also conducted numerous secondary experiments ranging from growing protein crystals, to studying how fluids and structures react in weightlessness. Mission duration was 81 earth orbits in 128 hours, 27 minutes, 34 seconds. BIRTHPLACE AND DATE: Born April 28, 1943, in Orange, Texas, but considers Seattle, Washington, to be his hometown. His mother, Mrs. C. Alberta Creighton, resides in Seattle, Washington. PHYSICAL DESCRIPTION: Brown hair; hazel eyes; 5 feet 10 inches; 160 pounds. MARITAL STATUS: Married to the former Terry Stanford of Little Rock, Arkansas. Her parents, Helen and Jim Stanford, reside in Stone Mountain, Arkansas. RECREATIONAL INTERESTS: He enjoys skiing, tennis and boating. ORGANIZATION: Member of the Society of Experimental Test Pilots. SPECIAL HONORS: Awarded the Defense Superior Service Medal, Distinguished Flying Cross, 10 Air Medals, the Armed Forces Expeditionary Medal, the Vietnam Cross of Gallantry, the NASA Leadership Medal, 3 United States Space Flight Medals, the French Legion of Honor and the Saudi Arabia King Fahd Medal. EXPERIENCE: Creighton started flight training following graduation from Annapolis and received his wings in October 1967. He was with VF-154 from July 1968 to May 1970, flying F-4J's and made two combat deployments to Vietnam aboard the USS RANGER (CVA-61). From June 1970 to February 1971, he attended the U.S. Naval Test Pilot School at Patuxent River, Maryland, and upon graduation was assigned as a project test pilot with the Service Test Division at the Naval Air Station Patuxent River. During this two year tour of duty, he served as the F-14 engine development project officer. In July 1973, Creighton commenced a four year assignment with VF-2 and became a member of the first F-14 operational squadron, completing two deployments aboard the USS ENTERPRISE (CVN-65) to the Western Pacific. He returned to the United States in July 1977, and was assigned to the Naval Air Test Center's Strike Directorate as operations officer and F-14 program manager. He has logged over 6,000 hours flying time, the majority of it in jet fighters, and has completed 500 carrier landings and 175 combat missions. NASA EXPERIENCE: Selected as an astronaut candidate by NASA in January 1978, Creighton became an astronaut in August 1979. During the following four years he held a variety of technical assignments in support of the Space Shuttle Program. Creighton was pilot of STS-51G which launched from the Kennedy Space Center, Florida, on June 17, 1985. During the mission the crew deployed communications satellites for Mexico (Morelos), the Arab League (Arabsat), and the United States (AT&T Telstar). They used the Remote Manipulator System (RMS) to deploy and later retrieve the SPARTAN satellite which performed 17 hours of x-ray astronomy experiments while separated from the Space Shuttle. In addition, the crew activated the Automated Directional Solidification Furnace (ADSF), six Getaway Specials, participated in biomedical experiments, and conducted a laser tracking experiment as part of the Strategic Defense Initiative. After completing 112 earth orbits in 170 hours, STS-51G landed at Edwards Air Force Base, California, on June 24, 1985. Following his flight, Creighton became the astronaut representative to the Shuttle Program Manager. During the ensuing two years, Creighton participated in all the key decisions following the Challenger disaster helping to shape the plan for resuming safe manned space flight. Starting with STS-26, Creighton served as Lead "CAPCOM" for the first four Space Shuttle flights. In March 1989 he was assigned to command STS-36 but continued to serve as Head of the Mission Support Branch in the Astronaut Office until commencing full time for his upcoming flight. Captain Creighton and his crew launched from the Kennedy Space Center, Florida on February 28, 1990 aboard the Space Shuttle Atlantis. The STS-36 mission carried Department of Defense payloads and a number of secondary payloads. After 72 orbits of the earth in 106 hours, the STS-36 mission concluded with a lakebed landing at Edwards Air Force Base, California, on March 4, 1990, after traveling 1.87 million miles. Following STS-36 Captain Creighton headed up the Operations Development Branch within the Astronaut Office for one year prior to resuming full-time training for his next command. Captain Creighton commanded the crew of STS-48 aboard the Space Shuttle Discovery, which launched from the Kennedy Space Center, Florida, on September 12, 1991. STS-48 was a five day mission during which the crew deployed the Upper Atmosphere Research Satellite (UARS) which is designed to provide scientists with their first complete data set on the upper atmosphere's chemistry, winds and energy inputs. The crew also conducted numerous secondary experiments ranging from growing protein crystals, to studying how fluids and structures react in weightlessness. Following 81 orbits in 128 hours the mission concluded on September 18, 1991 with a landing at Edwards Air Force Base, California. With the completion of his third mission, Creighton has logged a total of 403 hours in space. Family: Astronaut. Country: USA. Flights: STS-51-AA, STS-51-G, STS-36, STS-48. Projects: STS. Agency: USN. Bibliography: 12, 4457, 5289. 1943 April 28 - . Birth of John Oliver Creighton - . Nation: USA. Related Persons: Creighton. 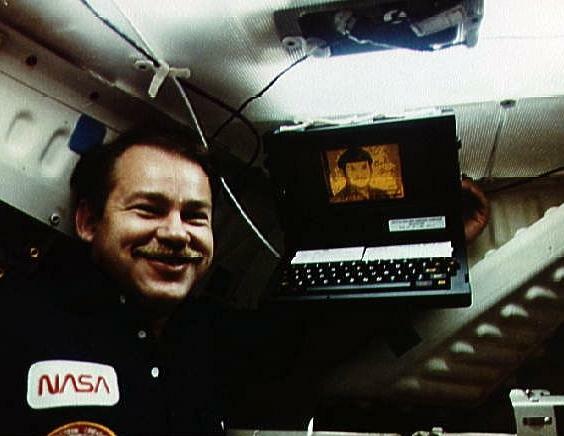 American test pilot astronaut 1978-1992. Grew up in Seattle, Washington. Flew 175 combat missions in Vietnam. Bachelor navy fighter pilot with a midnight blue corvette and a ski boat dubbed Sin Ship. 3 spaceflights, 16.9 days in space. Flew to orbit on STS-51G (1985), STS-36, STS-48. 1990 February 28 - . 07:50 GMT - . Launch Site: Cape Canaveral. Launch Complex: Cape Canaveral LC39A. Launch Platform: MLP1. LV Family: Shuttle. Launch Vehicle: Space Shuttle. STS-36 - . Call Sign: Atlantis. Crew: Casper, Creighton, Hilmers, Mullane, Thuot. Payload: Atlantis F06 / KH-12 1. Mass: 115,900 kg (255,500 lb). Nation: USA. Related Persons: Casper, Creighton, Hilmers, Mullane, Thuot. Agency: NASA Houston. Program: STS. Class: Manned. Type: Manned spaceplane. Flight: STS-36. Spacecraft Bus: Shuttle. Spacecraft: Atlantis. Duration: 4.43 days. Decay Date: 1990-03-04 . USAF Sat Cat: 20512 . COSPAR: 1990-019A. Apogee: 204 km (126 mi). Perigee: 198 km (123 mi). Inclination: 62.00 deg. Period: 88.50 min. Manned five crew. Deployed a classified payload. Landed at: Runway 23 dry lake bed at Edwards Air Force Base, . Landing Speed: 368 kph. Touchdown miss distance: 494.00 m. Landing Rollout: 2,407.00 m. Payloads: DoD Mission - Record altitude (through 5/93). 1990 March 4 - . Landing of STS-36 - . Return Crew: Casper, Creighton, Hilmers, Mullane, Thuot. Nation: USA. Related Persons: Casper, Creighton, Hilmers, Mullane, Thuot. Program: STS. Flight: STS-36. STS-36 landed at 18:13 GMT. .